For a 24-hour period starting at 1:00 p.m. on Oct. 3, crowds of spectators filled the Concourse to watch Eric Limeback attempt to set a Guinness World Record. 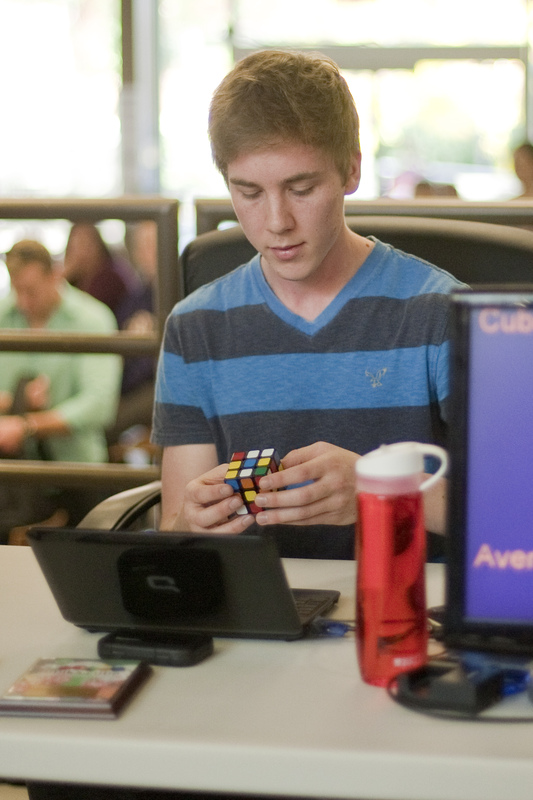 Limeback, a third-year business student at Laurier, set out to break the world record for the most Rubik’s Cubes solved in a day. He successfully broke the record by 1,014 cubes solved. By the time he was done, Limeback had broken the world record with 5,800 Rubik’s Cubes at an average rate of 14.89 seconds per cube. Limeback hopes to be in the next Guinness World Record book once the company approves his record. Limeback has been solving Rubik’s Cubes since he was 14, after being influenced by a friend who could solve one in two minutes. His previous record was 900 cubes in four hours, but this was his first attempt to break any world record. He is ranked as the third fastest Rubik’s Cube solver in Canada, with an average of 9.3 seconds per cube. He is also ranked first for solving a cube blindfolded. “He has so many techniques as to where to put his wrists and everything, so I think he can break it,” said Samantha Dean, a first-year sociology student who came out to watch Limeback. Originally, the record for the most Rubik’s Cubes solved was 4,786 by Milán Baticz from Hungary. Limeback set out with the goal to solve over 5,000 cubes, as a student in Germany unofficially beat Baticz’s record with the same amount. Just 14 seconds after he first started, Limeback had already solved his first cube. Two minutes later, he had six. To help make the process faster, five of Limeback’s friends would take a solved cube, rearrange them and hand them back. During his 24-hour attempt, Limeback was allowed a five minute break every few hours to use the bathroom, eat and place his hands in ice-cold water. He only took about 90 minutes overall in terms of breaks. By Friday at noon, Eric had solved 5,000 cubes, exactly 214 more cubes than the previous record-holder. The crowd had tripled in size from the day before and people were chanting his name. Limeback even solved a Rubik’s Cubes blindfolded in just 20 seconds. There were stations, such as CTV and SunTV, taping Limeback’s progress and the news even made it onto sites such as Reddit, where Limeback conducted an AMA (Ask Me Anything) thread with over 1,200 comments and questions. Limeback said he’ll be taking a break from solving any Rubik’s Cubes for a while, and for those wondering, do not worry — his wrists and hands are fine.